Please note: this headset is for personal use only and will not function within a Sonetics Team Wireless System. Adds Bluetooth™ wireless technology to the features included on the APX373. 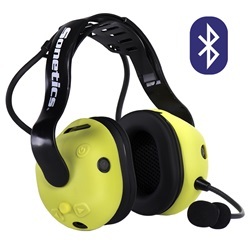 Pair your mobile phone to make phone calls or listen to music or connect with your enterprise Bluetooth enabled device, all while providing advanced hearing protection. Independent adjustable volume levels for listen-through and ear dome speakers allow you to control what you hear. With wireless Bluetooth, wired portable two-way- radio connectivity and an integrated personal sound dosimeter, this wireless headset provides unparalleled features and safety. Watertight and verified and validated to perform in extreme environments, the APX375 protects your hearing while you get the job done. ADVANCED HEARING PROTECTION WITHOUT ISOLATION Stereo Listen-Through – We have found the most common issue with hearing protection is the isolation users feel when wearing them. We added Stereo Listen-Through to all of our Apex 3-Series headsets for critical situational awareness. 24dB NRR – With 24dB of certified NRR protection, our headsets are ready to go where you need to be. Personal Sound Dosimeter – Hearing protection is nothing if it’s just a guess. This is why we added a personal sound dosimeter to every Apex 3-Series headset. Know you are wearing the headset correctly and have the protection. Active Sound Management – We manage sounds from all communication sources to ensure optimal clarity and protection. This is done with the noise canceling and auto-leveling microphone, automatic loud noise suppression, and personal sound dosimeter with automatic input gain adjustments. RUGGED We know your job may take you anywhere so we designed our headset to go anywhere you do. Marine – Sealed against salt spray and moisture. Winter – Operation down to -22°F (-30°C). Summer – Operation up to 158°F (70°C). Accident – Drop tested to 13 feet (4m). Cleanliness – Easy to clean surfaces. APX375 Quick Start Guide Start working with your APX375 Radio Transmit headset.